Guernsey newspapers of 1917-18 carry no mention of the fact that there was an active French seaplane base at the Castle Emplacement during that period. Davis (1) states that this was because of the "mild form of voluntary censorship instituted at the out break of the war". However Davis (1), in a series of articles written after the war, describes several visits by airships and seaplanes in 1916 and early 1917. These were the forerunners of the establishment of a seaplane base, agreed by the French and British governments but run by the Aviation Maritime Française. The stretch of water between Guernsey and England was the scene of much German submarine activity, so a convoy system had been introduced. Ships for English ports were formed into convoys west of the Scilly Isles and were escorted by British naval ships up the channel, travelling close to the English coast. Similarly, vessels for French ports assembled at Ushant and were escorted by French warships. The journey from Ushant to Calais can be made within sight of the French coast except for the portion between Tréguier, in Brittany, and Guernsey. There were already aviation centres in Cherbourg and Tréguier, and a station in Guernsey established a link between the two. The Guernsey station would initially form an annexe of the Cherbourg Aviation Centre, and was to receive a permanent section of two or three seaplanes, each commanded by a Pilot Officer, and with an observer. Other personnel assigned to the base were to be a Second Master Mechanic, three Quartermaster Specialised mechanics, three Seaman Mechanics, one Seaman Radio TSF, one Seaman Gunner, one Seaman Specialised, one Seaman Carpenter and one Seaman Signaller. There were also to be two or three non - commissioned pilots. The Guernsey station was to have responsibility for patrolling the area of sea between the island and Tréguier, but they also covered the seas around Alderney and Les Casquets along with British, French, and later American, seaplanes based in Cherbourg. The Model Yacht Pond was drained to form a site for one of the four hangars, and a double row of accommodation huts for the aviators was built between the Harbour and the Model Yacht Pond. The hangers were Bessoneaus, built of metal frames bolted together, then covered with heavy green canvas tied to the framework through brass eyelets. 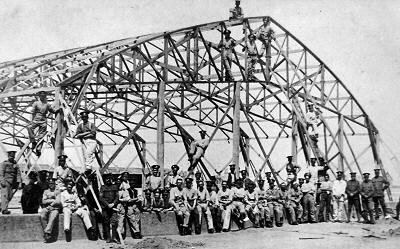 Special buildings for aviation fuel, oil, and storage for the station's reserve of ten bombs and 2,000 machine gun magazines were also required. The work, including the installation of water supplies and electric light, was carried out by the Guernsey Company of Royal Engineers, "assisted by a few French bluejackets", under the supervision of Ensign de Vaisseau Séguier then Ensign de Vaisseau Dauvin. It was officially opened in August 1917, with M. le Cour-Grandmaison as Commandant. 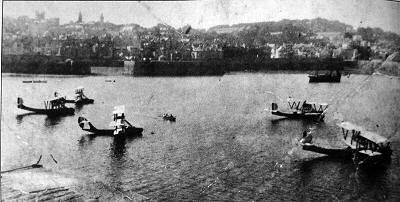 There were ten or twelve seaplanes based on the island, with between 6 and 10 pilots available at different times. Officers at the base included First Lieutenant Yves Maheas, pilot, Lieutenants Réné de St Maurice, pilot, Henri Boissan, observer, and Marcel Le Parmentier, observer, Second Lieutenant Maurice de Rodellec du Porzic, observer, and Engineer Officer Dousselin. When the work was completed, a party of about 100 men, consisting of Officers, Petty Officers (who were employed as observers) and mechanics also arrived from Cherbourg, on the barge Corail, which was pulled across by an armed tug. Regular patrols were established immediately, with seaplanes working in pairs from daylight to dark. It was originally intended that the seaplanes, or hydravions, would come ashore on specially strengthened ramps previously used for launching boats, but it was eventually decided that they would be lifted out by cranes instead. Initially they used pigeons trained to carry back information, but soon all seaplanes were equipped with radios. The planes themselves are described by Davis as being "mainly biplanes with a single boat shaped float," though a couple of triplanes were brought over in 1918 "but were not much used." The biplanes were Tellier 200s and FBAs, as the technical specification and date match the description in Davis. These were 200hp single engined hydravions, carrying two 52kg bombs, and could be fitted with a machine gun at the front of the fuselage. They could carry a crew of two or three men on a four hour patrol at 130Km/h and could climb to 2,000m in about 16 minutes at full power.